Well… it’s finally over! I’ve fought, whined and erred my way though the BFI’s packed programme, ending the twelve days with a total of SEVENTEEN premieres covered (including this one). I missed one premiere because of an event rescheduling, and another because I stupidly walked away from something that looked like nothing… and I did that because the prior night there’d been something that looked like something that ended up being nothing. 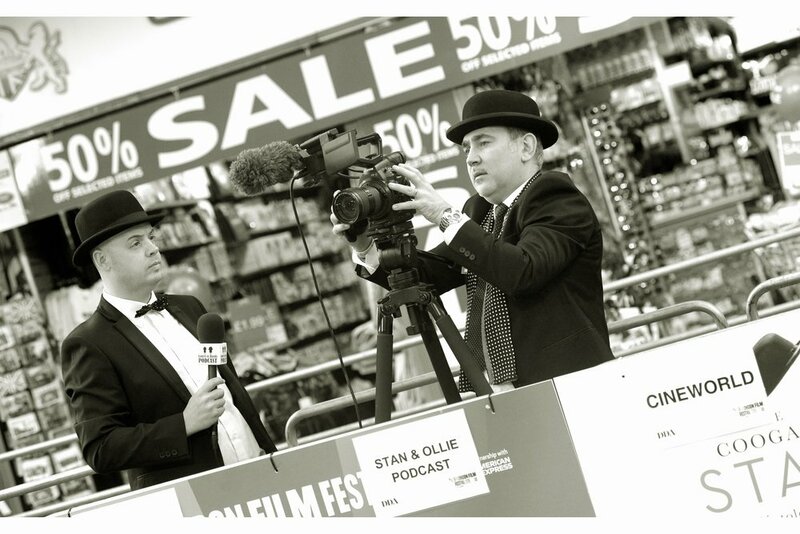 It’s Stan and Ollie ! Deep down, I feel I’m probably letting down a whole lot of Septagenarians and Octagenarians when I admit that I can’t really distinguish between Laurel & Hardy and Abbott & Costello. I’m more of a Marx Bros fan myself. Here, back in the present day, things are better. Not only do Movies have sound, but we’ve more or less fought our way out of the “turn the last book in the series into two movies” era, past the “we can turn anything into a cinematic universe” era to “these franchises will never end, and when they do we’ll reboot them”. “Remember how we were just teenagers when this thing started? It’s certainly aged us….” I’m not the same person now that I was 12 days ago, that’ for sure. I was going for a thing…. “It was like that when I got here, and that’s all I’m saying.” For only the second (third?) time this Film Festival, a premiere had a stage, and for the FIRST time people were interviewed FACING the audience. Well…. assuming the audience was in the park, not in the public pen. Rufus Jones’ imdb entry is staggeringly long… but because I’ve steadfastly refused to culturally acclimatise myself to UK Culture, I am familiar with next to none of it. He was the voice of ‘The Flying Scotsman’ in several episodes of Thomas The Tank Engine, though, which gives you more of an idea about me than about Rufus Jones, I suspect. OMG : It’s a 1930s Pop Culture Reference!!! You Gotta Clap if you Get it!!! “Check it out. That guy over there is wearing a bowler hat and a kilt…. quite frankly he looks ridiculous!” - John C. Reilly plays Oliver Hardy in this movie. “Was that a gust of wind, or a physical gag that had them rolling in the aisles as little as seventy years ago? I’ll never tell”. Steve Coogan is best known for being Alan Partridge across several TV Series and I believe even a movie. I’m not British, though, so for me he’s better known for roles in films like “What Maisie Knew” and “Philomena” - he’s very good in both. Steve Coogan plays Stan Laurel in this movie. “Are you touching me? Are you about to touch me? Are you sure you should be doing that? Are you sure it’s safe to hesitate? How do you know I’m not reaching for my handgun right now? How do you know I don’t have psychic powers? Wait… is that even your hand or is it somebody else’s? ” Jon S. Baird is this film’s director, and I believe I last photographed him at the premiere of the movie “Filth”. Faye Ward didn’t just produce this movie, she also produced “Wild Rose” which also had its BFI London Film Festival premiere this year. “Well… Abbot and Costello met the wolfman, while Laurel and Hardy, they… they…. ummm…”. Yeah.. it’s tricky. I don’t know either. Jeff Pope wrote the screenplay for the movie (and also co-wrote ‘Philomena” with Steve Coogan, for which they were both Oscar nominated). And though it’s subtle, he’s also wearing a bow-tie. I’m not wearing a hoodie, exactly. Or rather I’m wearing a hoodie, but I’m wearing a jacket on top of it. Which, weirdly, also has a hood. Director Edgar Wright, Day 1 of BFI LFF. I think that, like me, he was younger, and sprightlier back then. Director Edgar Wright, Day 12 of BFI LFF. I don’t know who this is, but if like me she’s done every day of this London Film Festival I’m both surprised I missed her, and impressed that she’s held up so well. So.. that was that. 17 premieres in 12 days to add to The Archive of Premieres, a total lack of sleep, somewhere between 2 and 3 friendships compromised…. and it’s Sunday so I’ve got a full working week to look forward to… and I think that should be relaxing. ps. If you ever want to know when I post one of these journals (and, in the case of BFI London Film Festival, chart my psychological unraveling), feel free to follow me on facebook at premieresdotco, or on twitter at berndt2_photo. I for one plan to spend my time forgetting much of what happened at this one.